On the planet Varos, prosoners and guards alike are subject to punishment, wheich are then broadcast to the masses as entertainment. ailing Tardis, but when he and Peri arrive, they are caught up in events beyond their control. Freeing the rebel leader Jondar and incurring the wrath of the sinister alien Sil are just the beginnings of their ordeal. 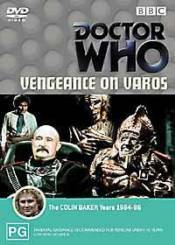 Hunted through the concealed terrors of the punishment dome, the doctor becomes the subject to Varos's latest TV entertainment. But this is one show where he is not expected to survive beyond the cliffhanger. **Commentary by Colin Baker, Nicola Bryant & nabil Shaban.